This morning a Muslim terrorist was arrested by French police after he tried to ram his car into pedestrians in the terminal at Lyon’s airport. A man was reported driving at high speed going the wrong direction on a highway from the Ain department for dozens of kilometres. 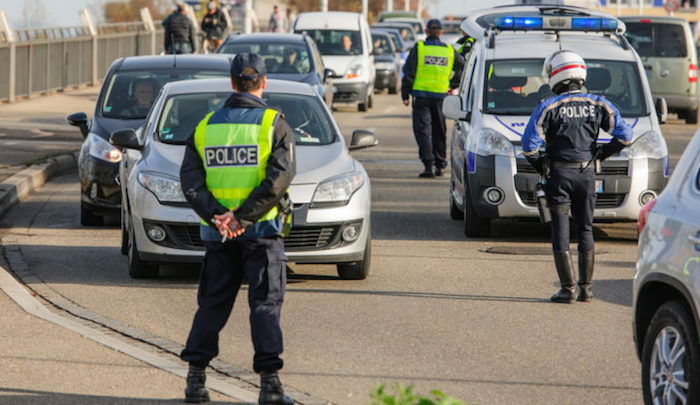 He was stopped by police but managed to flee with his car then went to Lyon-Bron’s airport, while trying to mow down pedestrians, fortunately without success. The suspect went on to the Saint-Exupéry Airport while under fire by four or five police officers, all of whom were unable to hit him. The man crashed through two glass doors entering the airport terminal where he was finally stopped by a security agent, who was able to stop him with his defence stick. According to police sources the man shouted “Allah Akbar” and said that he was “sent by God” when he was arrested. “The man first drove the wrong way on the A43 highway and crashed into a barrier at a small aerodrome before heading to Lyon’s much larger Saint Exupery airport,” a local government press officer says. Christelle Monteagudo added that “the car rammed through two glass doors at the airport’s Terminal 1 to drive onto the runways”. According to her the man’s motives were unknown and that nothing was being ruled out.